Britton Hill is a blip on the side of Florida’s County Road 285, a small highway near the state’s border with Alabama. The site is modestly appointed with a granite, tombstone-like marker and two park benches. The average Florida tourist, bound for a hot beach or the splashy allure of Disney World, might stop to stretch their legs. But more likely, they would just roll on. Unless they were a highpointer. Unremarkable as it seems, at 345 feet above sea level, Britton Hill is the highest natural point in the state. A highpointer, driving for hours or perhaps days, maybe from the other side of the country would arrive triumphant and leave their mark in the register. One point closer to victory. As the name suggests, highpointers are people who aspire to climb the highest natural points in every state. 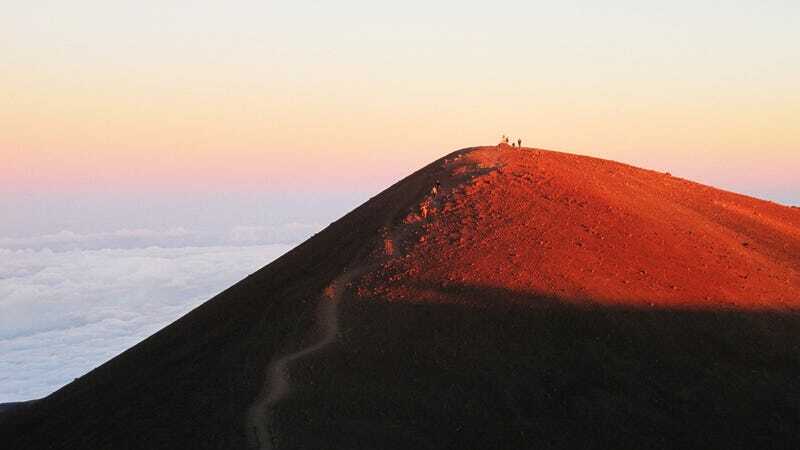 The drive to get really, really high up is an old one; to quote the famed climber George Mallory, the motivation of looking at a mountain and wanting to reach the top boils down to “because it’s there.” But on the state level, the history is a bit more recent. In 1936 A.H. Marshall became the first man to climb all of the then 48 state highpoints. At that time, there was no official network, although all over the country, people were individually making the decision to seek out these places. Longacre died in 2002. Today, the club has about 2,500 members. One such member is Tim Webb, an avid hiker who spends a fair amount of time poring over his Rand McNally road atlas. He always felt the tug of the highpoints, clearly marked on each state map. The urge eventually led him to the Highpointers Club, where he is the current president. For $20 a year, members receive the “Apex to Zenith” newsletter and an annual directory packed with tips and contact information.The club also holds an annual “Konvention” at a state highpoint where members meet, swap stories, and recognize “completers” who have achieved the benchmark or 48 or 50 states in the past year. Webb has 46 highpoints under his belt. Montana, Alaska, Washington and Wyoming (the four “tough ones”) remain. His wife, daughter and son have all climbed 36 highpoints. (His daughter made some of those journeys as an infant strapped to her father.) Everyone has their favorite highpoint for different reasons, he says, but for him it’s Mount Whitney, the highest point in California and also the highest in the lower 48. It’s also where Webb hit his “halfway” mark of 25 highpoints. The diversity of highpoints is staggering. The highest point in the 50 states is Mount McKinley in Alaska. The lowest is Britton Hill, the hump in Florida. There’s a weather station and an observatory on top of Mount Washington in New Hampshire. Wild ponies roam Mount Rogers in Virginia. There are highpoints like Borah Peak in Utah where many climbers abort their trek when they hit the aptly-named Chicken Out Ridge. And then there are high points like Delaware’s Ebright Azimuth, barely a hill and about nine minutes from a Starbucks. There are as many kinds of highpointers as there are highpoints, according to Webb. Some members save all year to attend the big meeting and some “have more money than they know what to do with.” There are whole families. There is a brother and sister from the Netherlands. There are more male completers than female, but women have been gaining ground. Highpointers are so obsessed, they’ve created lists within lists. There are highpointers who aim to hit the most highpoints in 24 hours. (The record is eight.) Matt and Mike Moniz collected all 50 in the shortest amount of time: 43 days, 3 hours, 51 minutes and 9 seconds. (The slowest on record is Mike Bialos, who took a leisurely 52 years and 10 months to complete.) But highpointing doesn’t have to begin and end with the state landmarks. Many state highpointers have moved onto or are concurrently conquering county highpoints. And many highpointers also tackle international targets—from storied Mount Everest to Zugspitse, the highest point in Germany, which can be summited via a picturesque gondola ride. Tom Harper, another highpointer, didn’t consider himself an “outdoorsy” person. Growing up in the suburbs of Pittsburgh, an occasional picnic at a state park was as intrepid as things got. But like Webb, Harper found himself fixating on the high points marked in his road atlas. In 2003, he decided to climb Mount Davis, the highest point in Pennsylvania. He has since traveled to 34 highpoints and is a member of the Highpointers Club. Harper speaks as wistfully about the flats of the Oklahoma panhandle (home to high point Black Mesa) as he does of Hawaii’s Mauna Kea where he felt like he was at the edge of the world, surrounded by a night sky unlike he had ever seen. When Harper reaches the top of a highpoint he snaps a picture. Many highpointers keep track of their travels through photography, often taking a portrait with an elevation sign or USGS benchmark. Others fill in states on a map or keep journals. Webb and Harper are still whittling down their lists. Webb says he hasn’t “committed” to Alaska, but hopes to cross off Montana next year, when the state convention is held in that state. Harper is still knocking off state milestones and is also tackling county highpoints. A few years ago, he climbed the Stafford County, Virginia highpoint with a fellow summiteer who was 83 at the time. This post originally appeared on Atlas Obscura, the definitive guide to the world’s wondrous and curious places (and people and things.) For more stories, visit atlasobscura.com.